There’s something effortlessly sophisticated about photographing at these iconic spots in New York. 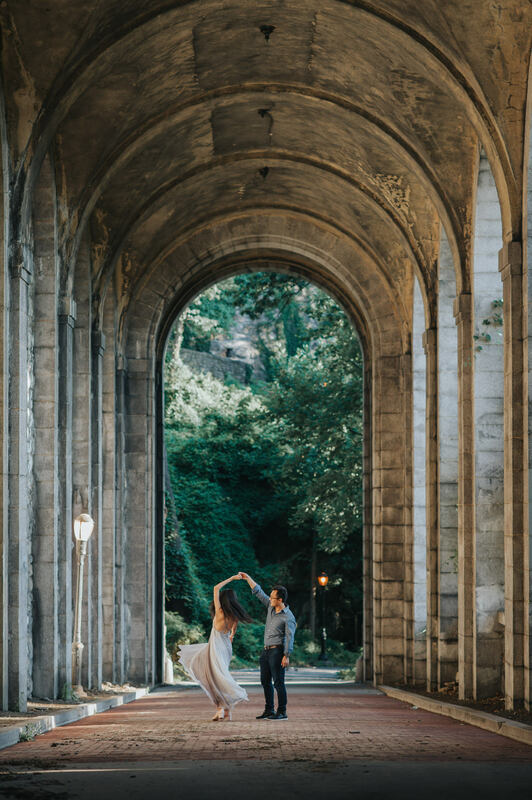 We spent a phenomenal day hopping across this magical concrete jungle of a city to create this set of engagement photos. To tell you a secret, this engagement session also makes a perfect itinerary for rediscovering-NYC-in-1-day. Whether you’re a native or a visitor, simply experiencing these spots at a different time of day, with a new perspective, truly reveals the essence of NYC. Hope you enjoy this set, follow us along to the Brooklyn Bridge, Dumbo, Central Park, and the Cloisters! Can this spot be any more over-photographed? The answer is yes, and that’s why we started at dawn to catch the magical blue light before sunrise and to escape the crowd. The concrete and steel mix overlooking a classic skyline never gets old. As the sun comes up and casts the steel rails gold, we took advantage of our lighting setup to balance the foreground and background seamlessly. As Sinatra sings about Brooklyn Bridge – “The wind through her strings, the cloud in her hair”, it’s all there. We love this Instagram-famous spot in Dumbo that’s optimally stationed with the enormous Manhattan bridge as a backdrop (walkable from the Brooklyn bridge Dumbo side). Again – a quintessential NYC spot with its infamous red brick buildings and narrow street, it feels eager while also limitless in possibilities. Watch the busy traffic in this area, but hey, being speedy and opportunistic is a must in this city right? There’re quite a few coffee shops here, perfect for a break after the early morning session. By now, the sunlight gets less optimal for photos, so take a nap then make an outfit change for the afternoon at the Central Park. This iconic park is massive. Let’s get straight to the point and join the liveness at the Bethesda fountain near 72nd street. Grab a sweet moment by the sun-lit fountain, then catch some shade under the lower passage which happens to be lined by beautiful stone carvings. To complete the ultimate romantic activity at Central Park, rent a rowboat across the Central Park lake. The verdant backdrop creates an illusion that you’re the only ones there (while in real life surrounded by crowds). Just a train ride north from the concrete jungle of Manhattan will lead you to this serene park by the Hudson River. You’ll find phenomenal European medieval architecture at the Cloisters museum, and the wooded park it’s nestled in provides a gorgeous panoramic view of the city. Prepare a long, free-flowing dress (girl) and a deep/rich coloured shirt (guy) for this whimsical spot – perfect way to wrap up the day over sunset. So there you have it, a thoroughly enjoyable and highly photogenic day in the big apple. If that sounds like the type of refined experience you’d like to have for your engagement photoshoot, let’s chat!